Are you trying to do squats, but can’t seem to get the right form? Is your low back giving you grief? Are your knees sore when you’re walking or hiking? Do you sometimes feel a pain on the front of your hip when stand up, or when you stand up and take your first step? Can you touch your toes? Or, have you never been able to touch your toes? These situations can all be caused by your hips not moving well. 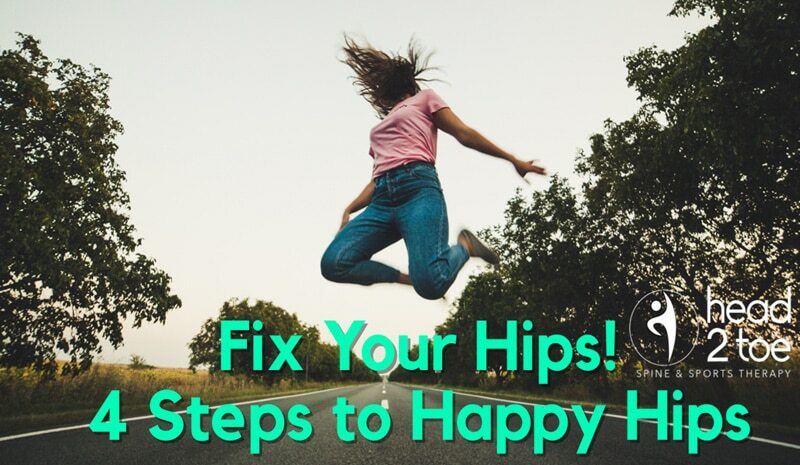 Your hips are the machine that give your body the power to move – and with that level of importance, you want to have them work as well as they can for as long as they can. Hip tightness is a big problem for lots of people, because as a society we sit too much – no surprises here. Even if you faithfully work out 3-5 times per week, if the rest of the time you’re sedentary – you’re sitting too much! However, sometimes finding and getting into the routine of attending a new class, can make the whole proposition overwhelming and unworkable. There are, however, easy stretches you can do to help your hips move better – and when your hips move better, everything above and below your hips will move better too. I put together some videos on simple and straightforward hip stretches, which can be found on the H2T facebook page or YouTube. A great addition to the stretches is foam rolling your hips. If you’re a current patient at H2T, we’d be happy to give you a guide to foam rolling not only your hips but your whole body. Just ask! If you don’t find improvement with any achiness or pains you have in your hips, low back or knees with this work, come and see myself or any of the providers here at H2T.